Frederica "Freddi" DuMortier, of Cary, passed away peacefully with her family present on October 30, 2017 at Wake Med Cary. Born July 29, 1935 in Franklin, NY, She was the daughter of the late Eva and Orville Hanson. Frederica graduated from Franklin Central School and Delhi Tech. Frederica is lovingly remembered by her husband of 57 years of happiness, Robert "Bob" DuMortier. 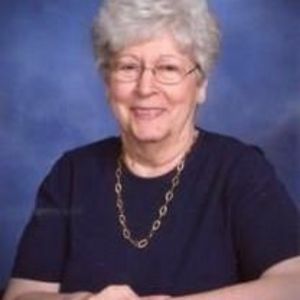 Freddi was a stay at home Mom raising three children; Susan (Chuck) Butwinski of Pinehurst, NC, David DuMortier of Cary and Michael "Mike" (Kelly) DuMortier of Fuquay-Varina, NC, and grandchildren Alexandra Butwinski and Jonah DuMortier. She is also survived by sisters; Ruthann Benedict of Colorado Springs, Alice (Arnie) Teachout of Omaha and brother Birdeen (Mary Ellen) DuMortier of Florida, brother-in-Law Paul (Henny) DuMortrier and sons John-Paul and Andre of St. Simons Island, GA.
A Mass of Christian Burial will be held at St Michael The Archangel Catholic Church(804 High House Road, Cary, NC 27513) on Wednesday, November 15, 2017 at 12:00 PM. Visitation with the family will start at 11:00AM. In lieu of flowers contributions can be made to: Kidney Foundation of North Carolina, 200 Eastowne Dr., Chapel Hill, NC 27514.